Tree-­house / Sculpture shell in polyester resin, steel, glass, covering skin in stainlees steel welded modules. 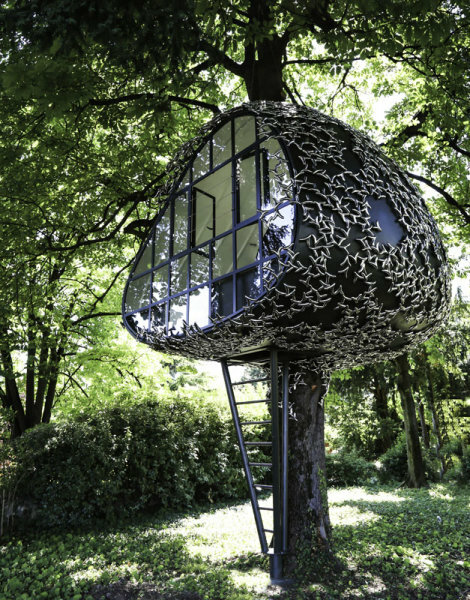 The Garden’s Jewel is an installation/tree house in Grenoble, France. It’s part of his series of idealized dwelling systems up on the trees or on wheel, small spaces designed around the idea of caravan, trailer, roulotte, combining sculpture and the tradition of utopic architecture. Loris Cecchini engages its audience and temporary inhabitants, on public-private grounds, in geopsychic practices.